The Skinny: A charlatan Taoist priest with a talent for talking to dead people gets caught in a struggle between innocent villagers and some magical bandits in this silly third entry in the popular Mr. Vampire series. McMillin: After a foray into modern times for Mr. Vampire II, the filmmakers behind Mr. Vampire III decided to take a more “back-to-basics” approach, as the main action of this installment returns to the original’s Qing dynasty setting. This time, the plot centers on Uncle Ming (Richard Ng), a Taoist priest who roams from town to town as a kind of ghostbusting vagabond. Predating Peter Jackson’s The Frighteners by about nine years, Mr. Vampire III bears a strikingly similar premise. It seems that Ming has the ability to see and talk to dead people, and in the process, he’s befriended two friendly ghosts, the adult Ta Pao (Lui Fong) and the much younger kiddie ghost, Hsi Pao. The three of them strike up a deal – the ghosts will haunt some houses, and Ming will show up to collect the reward for “exorcising” the spirits. However, it turns out that the happy trio's seemingly perfect con possesses an expiration date. The film begins with the group’s disastrous attempt to spook some people who happen to be living in an already haunted house. When the malevolent ghosts forcibly eject Ming and his supernatural buddies from the rustic household, the three of them hit the road once more. But their aimless wanderings lead them directly into a sleepy little village that’s currently under siege by a group of dangerous, bloodthirsty bandits. But these aren’t your run-of-the-mill bandits - these folks are sorcerers, too. Clearly, the villagers have their hands full. 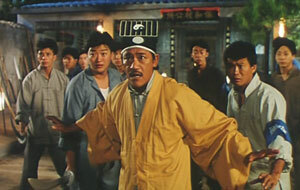 Once inside the city limits, Ming meets and befriends the One-Eyebrow Priest (Lam Ching-Ying, who dons the yellow Taoist robes for all of five seconds) and his moronic second-in-command, Captain Chiang (Billy Lau). An all-out battle with the invading hordes proves successful for the villagers, and the conquering heroes return home. But Ming’s overprotective ghost pals catch the attention of the disapproving One-Eyebrow Priest. Although Ming’s good-natured tolerance of his ghostly pals raises a few eyebrows (so to speak) among his newfound mortal pals, the Priest’s attention quickly turns away from debating the civil rights of “the living impaired” to a much more important threat. Although seemingly vanquished, a female sorceress survived the battle and has plans to resurrect her dead brethren to exact unholy revenge. Yikes. Mr. Vampire III works best as an assemblage of amusing set pieces and sight gags. Ta Pao and Hsi Pao’s invisible manipulation of Captain Chiang’s body is one such example. Another is the One-Eyebrow Priest’s ability to fold up the ghost child as if he were nothing more than a human-sized piece of origami! Perhaps the film’s best gag involves a scene in which a naked Richard Ng is covered in black soot in order to hide himself from a muck-encrusted supernatural predator. And lest I forget, there’s also a guy in a giant bird suit chasing Richard Ng around during the finale. But as fun, inventive or just plain silly as these scenes are, they're just disparate scenes that don’t necessarily add up to some larger whole. One issue that's raised but then remains somewhat unexplored involves the ethics of vanquishing ghosts at all. For Captain Chiang, all ghosts are evil and should be destroyed, although he’s a bit prejudiced, considering that he was humiliated by Ta Pao and Hsi Pao for an earlier transgression. The One-Eyebrow Priest seems to think that ghosts should be trapped – he’s got an entire cabinet full of spirits sealed in containers – but doesn’t seem in too much of a hurry to send them to the next world. And Ming thinks it’s okay to hang around ghosts (and make a little money off them) since they’re not hurting anyone. Of course, it’s also important to recognize that these two bumbling ghosts seem to be Ming’s only friends in the world. And what about those ghosts? They seem to enjoy sticking around in the mortal plane, even though prior Mr. Vampire films suggest that they’d be better served by being reincarnated. This is probably too philosophically-heavy a topic for a silly vampire comedy, but it’s still an interesting train of thought to pursue.